The LillyPad project is investigating how mobile collaborative technologies can be designed to support and augment integrated inquiry processes both indoors and outdoors. Our approach is to enable students readily and meaningfully to switch their attention between physical activities in the field, digital interactions with a mobile computer and the collaborative interactions taking place in a group setting. In particular, we are developing mobile collaborative tools that can facilitate the fluid movement between observing what is in the physical world, collecting and recording real data in a database, comparing this with previously stored data, analyzing it using visualizations, and using this to generate hypotheses and draw conclusions that can be tested in the field. In so doing, our aim is to enable students to be able to practice more integrated inquiry processes; encouraging them to begin to synthesize and reflect more upon their various inquiries in both physical and digital worlds, and be able to communicate this to their peers and teachers in novel ways. 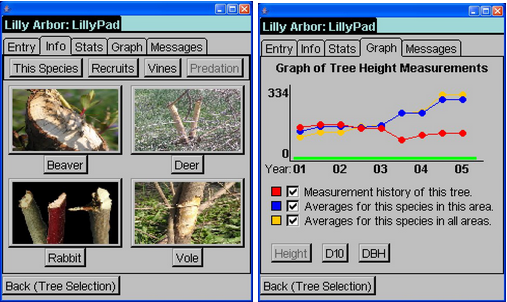 An example of a mobile PDA application we have developed is LillyPad, intended to be used outdoors, by teams of scientists and students for educational purposes. The handheld device is now being used as part of the Lilly Arbor project to help students and scientists record, learn and reason about an experimental floodplain reforestation site. We have found that a greater concern for the appearance of the interface enhanced the way the LillyPad tool was used, its usefulness and the overall user experience. In situ studies have demonstrated clear learning benefits. For example, the experience of being able to find pertinent information using the mobile device and to be able to share that information at the right moment in an ongoing collaborative task with other students was found to be rewarding, enabling the students to feel a sense of accomplishment. Being able to easily switch between the different functions and, importantly, knowing that there will be a piece of information that can be readily found that will be useful at that given point also contributed to the learning experience. Designing information to be readable, shareable (in the sense of being able to show it to another or read it out aloud) and aesthetically pleasing also played an important role in how the students felt about and used the application. Yvonne Rogers , Kay Connelly, Andrew J. Kurtz, Bob E. Hall, William Hazlewood, Lenore Tedesco and Tammy Toscos (2007) Why It’s Worth the Hassle: The Value of In-Situ Studies When Designing Ubicomp. In J. Krumm et al. (Eds.) Proceedings of UbiComp 2007, LNCS 4717, pp. 336–353. Rogers, Y., and Price, S., (2005) Extending and augmenting scientific enquiry through pervasive learning environments. Children, Youth and Environments, 14(2), 67-83. Rogers, Y., Price, S., Randell, C., Stanton-Fraser, D., Weal, M., and Fitzpatrick. G., (2005) Ubi-learning: Integrating outdoor and indoor learning experiences. CACM, 48(1), 55-59. Rogers, Y., Price, S., Fitzpatrick, G., Fleck, R., Harris, E., Smith, H., Randell, C., Muller, H., O’Malley, C., Stanton, D., Thompson, M. and Weal, M. (2004) Ambient Wood: Designing new forms of digital augmentation for learning outdoors. In Proc. Interaction Design and Children, ACM, New York. 3-10.